Parameter for Box-Cox transformation. See boxcox for details. Data to calculate Box-Cox log-likelihood for. If data is multi-dimensional, the log-likelihood is calculated along the first axis. 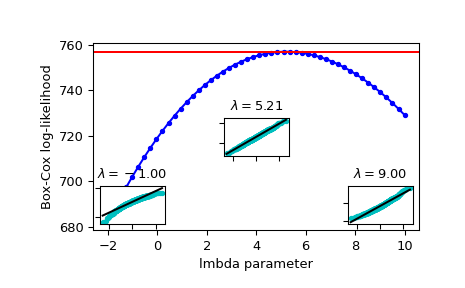 Box-Cox log-likelihood of data given lmb. A float for 1-D data, an array otherwise. where y is the Box-Cox transformed input data x.